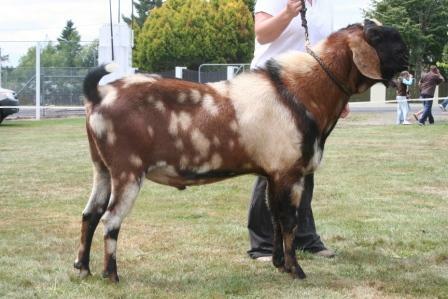 Anglo-Nubian goats are a relatively large, proud, and graceful dairy goat. They are named for Nubia, in northeastern Africa. The original goats imported from Africa, Arabia, and India were long-legged, hardy goats that had some characteristics desired by goat breeders in England. English breeders crossed these imported bucks on the common short-haired does of England prior to 1895 to develop the Anglo-Nubian goat. In the United States the breed is usually spoken of as the Nubian. Anglo-Nubians are an aristocratic appearing goat and have very long, pendulous ears that hang close to their heads. Anglo-Nubians carries a decidedly Roman nose and are always short-haired.